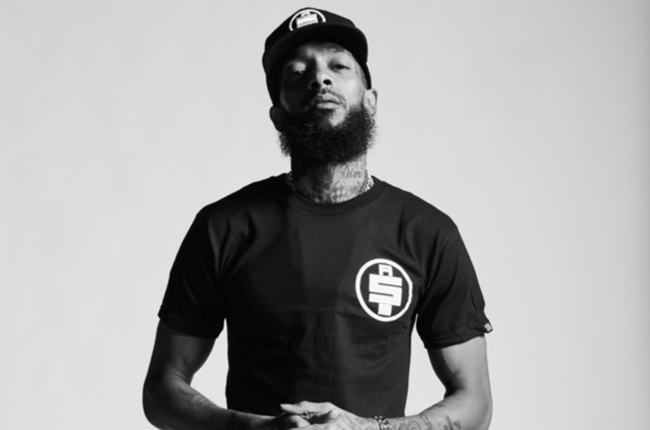 The world is mourning the loss of rapper and philanthropist Nipsey Hussle who was killed over the weekend in front of his Marathon clothing store in Los Angeles, CA. Born Ermias Asghedom, Hussle was an entrepreneurial rapper who bought a strip mall in the Crenshaw district of Los Angeles, creating businesses and jobs for people in the community. Forbes recently chronicled his philanthropy and business interests. Hussle rose to fame with a number of mixtapes and creative marketing techniques. For example, in 2013, he independently made 1000 copies of his CD Crenshaw, selling them each for $100. Rap legend Jay-Z purchased 100 copies of his CD raising Hussle’s profile outside of the independent rap industry. Hussle said he wanted to use a “scarcity model” to combat the idea of giving away music for free. Hussle released his first project, Slauson Boy Vol. 1, in 2005. In 2008, he released the mixtape Bullets Ain’t Got No Name Vol. 1. The Compton raised rapper’s last album, Victory Lap, was released in 2018 after years of anticipation and earned the philanthropist a 2018 Grammy nomination for Best Rap Album. 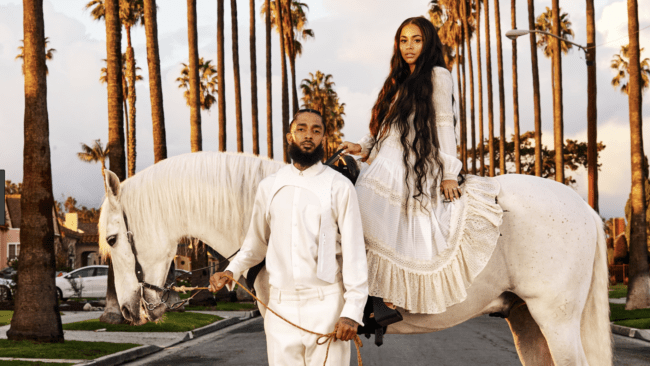 A father of two, Hussle was in a longterm relationship with actress Lauren London, having recently been featured on the cover of GQ magazine. Hussle and London share a son Kross, who was born in 2016. The doting father brought his daughter Emani (born from a previous relationship) and London to the 2018 Grammy Awards. 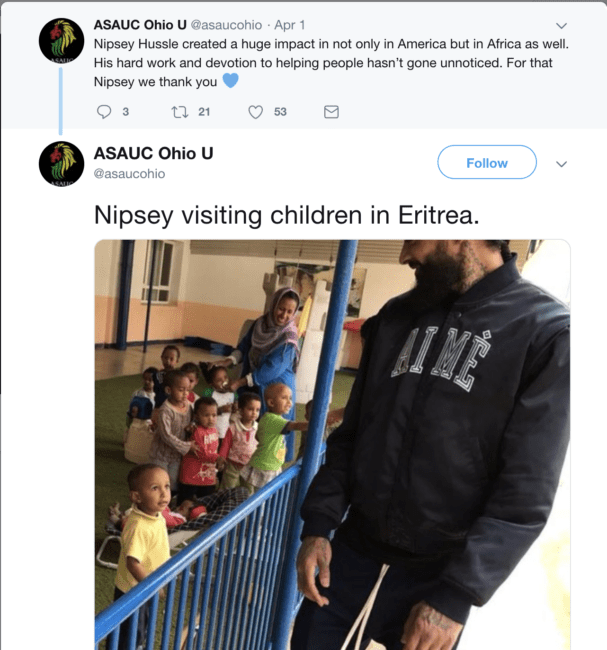 Hussle, who is of African-American and Eritrean descent, outfitted a local elementary school with sneakers for students and giving much needed renovations to the building. Hussle grew up with his mother, never meeting his father who was Eritrean. Hussle recently visited Eritrea learning about his East African heritage. A former gang member who turned his life around, Hussle was scheduled to meet with Los Angeles Mayor Eric Garcetti and the Los Angeles Police Chief Michael R. Moore to discuss how to end gang violence in Los Angeles the day following his death. Los Angeles police have issued an APB for Eric Holder, who is suspected of killing Hussle and injuring two others. Hussle was 33. Rest in power. This post was written by Nsenga K. Burton, Ph.D., founder & editor-in-chief of The Burton Wire. Follow her on Twitter @Ntellectual. Follow The Burton Wire on Instagram or Twitter @TheBurtonWire.